For this project, I wanted to look at the political implications of what it means to be a successful fine artist. I used data from http://www.artfacts.net to investigate further three specific factors of the top 100 ranked living artists: age, gender and location. The art gallery and museum as an institution plays an important role in the career of an artist. I used the metaphor of a museum, specifically the New Museum in New York, to show the different data. Each floor of the museum focuses on a different factor. 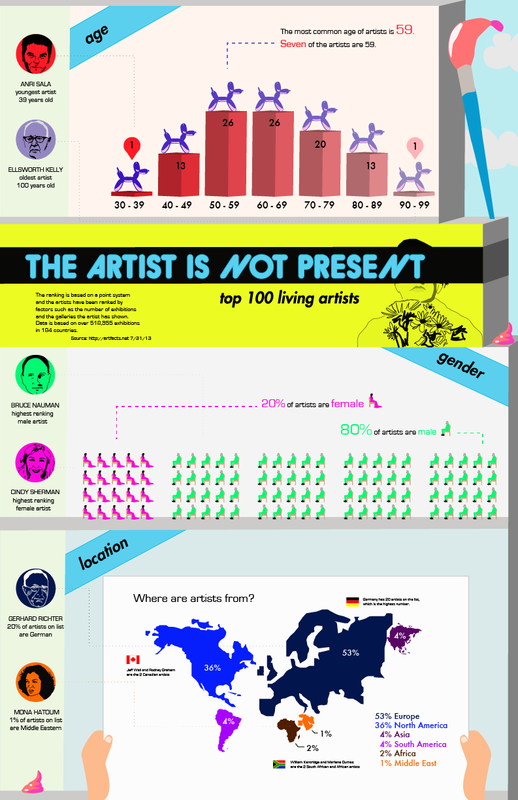 The title of the infographic comes from Marina Abramovic’s performance art piece “The Artist Is Present.” In this infographic, I am trying to show that in many cases the artist is not present, and the absence of artists from different continents and countries highlights this. Also, the inequality in gender also shows that there are many artists who are not being represented. My goal is to draw the viewer in with the playful graphics and then let the viewer decide what to do with the information presented.